Batteries do no good if left IN A DIFFERENT COUNTRY. A few weeks ago I went on an epic photo journey through Manning Park, Princeton, Penticton, Kelowna, Kamloops and the Fraser Canyon. Before I embarked on the PhotoJourney™ I thought it wise to purchase a spare battery. Having haggled a local drugstore down from $160 to $80, which I was quite happy with, I was set. I recently purchased a new Canon lens with Image Stabilization which is rumored to decrease battery life. While I took 650 pictures (many using the IS lens) I did not require the use of my new battery. The question was then – how long can I go before I need to swap out batteries? 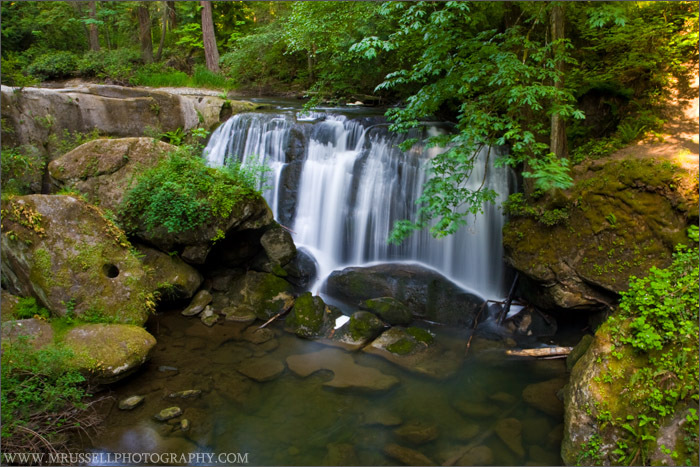 The following weekend I went on a quick trip across the US border to Whatcom Falls Park. I saw that the battery indicator was showing about 1/2 of its strength, which means it is almost dead. I still wanted to see how far I could go before swapping out with my spare battery. On the bridge I took about 15 quick pictures before the battery finally died. Nice – about 700 shots per battery! I reach into my bag to take out the spare. I couldn’t immediately find it. It must be in this flap… or this pocket or…. NOOOOOOOOOOOOOOOOOOOOOOOOOOOOOO! I actually told my bag NO in dramatic enough terms to elicit attention from passersby. Somehow the drive back to the border and home seemed longer than it should have. At least I got a good shot of the waterfall. Handheld for 1.6 seconds! Image Stabilization works pretty darn good I’d say, though I think I’m pretty lucky to have this shot turn out.